The cigar-smoking French writer, George Sand and her lover, the composer-pianist Chopin have rented a former monastery in Mallorca as a winter retreat. They have even shipped a piano to the site, so that Chopin can continue his work. However, what promised to be a warm, sunny vacation turns sour as the locals disapprove of Sand, the servants are surly and mysterious, and the monastery is cold. She has her revenge, however. 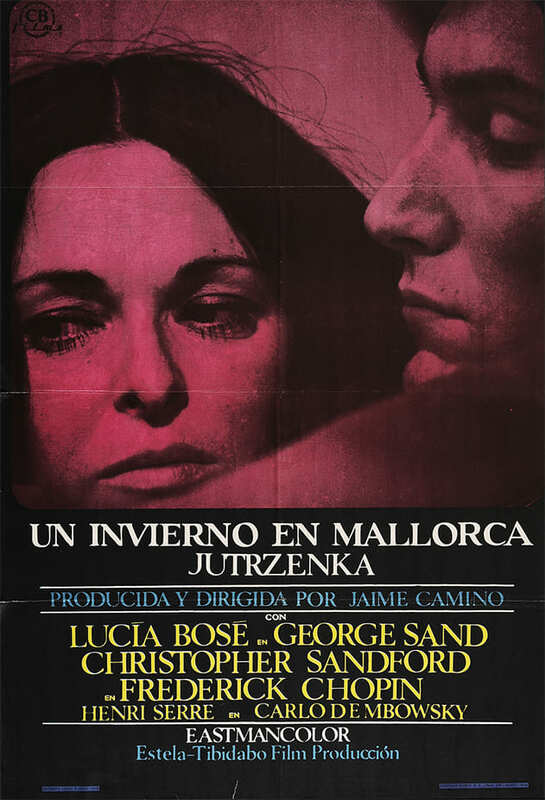 She wrote the book A Winter in Mallorca about her miserable winter retreat. This film follows that book closely, with concern for historical accuracy, which did not increase the Spanish filmmakers’ popularity with their countrymen. Jaime Camino is a Catalan director, producer and screenwriter; he is a great figure of spanish cinema, as brillant for documentaries or fictional films. He is one of the most important figures of the spanish cinema transitional period. Born in Barcelona, he graduated in Law and became a music teacher. After being a cinema journalist for magazines like Nuestros Ciné and Indice, Nadal Award’s finalist for his novel La Coraza, he directed short movies and his first full length film in 1963: Los Felices 60. He participated in the Barcelona movement founded by young producers trying to bring something new in the spanish cinema, then under Franco’s dictatorship. Then he founded his own production company Tibiado Films and starting dealing with a matter he kept on handling: the civil war in Spain. In 2004, he made a documentary: Childs of Russia.